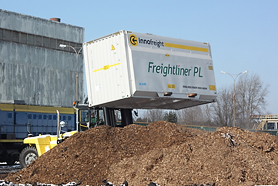 We have many years of experience in the transportation of biomass in the form of wood chips, oil cake and buttermilk. The biomass hauled by our wagons is used in co-firing systems in several of the largest power plants in Poland. Deliveries of biomass can take place in coal hoppers and under cover, as we the have appropriate tarpaulins. Thanks to the application of 12.76 meter long coal hoppers, we are able to load about 12% more material compared to the standard wagon sets. Our experience shows that it is possible to transport up to 1,400 tons of wood chips in one full train load. As part of our offer, we also provide comprehensive customs trans-shipment and forwarding services (customs clearance, preparation of documentation, calling for wagon assistance). We help our customers to organise freight handling and to complete all formalities on both sides of the border.